When initially constructed, the Town Hall has a crooked orange roof with a small stone chimney. The windows, doorway, walls, and poles are all made out of wood. You start the game with built the Town Hall of the first level. Among all levels it’s has the lowest amount of Hit Points: 1,500 . 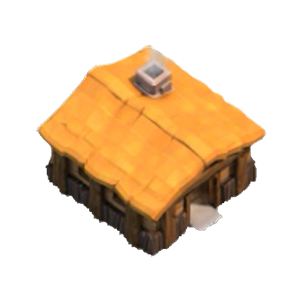 At this Level the Town Hall can store the following maximum amount of Resources: 1,000 and 1,000 . 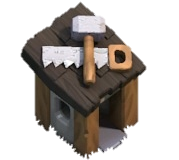 First level of the Town Hall allows you to build 13 Buildings (including the Town Hall itself, Traps and 5 Builder’s Huts, but not counting the Clan Castle’s ruin). The Walls are yet available.